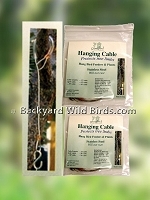 Bird Feeder hooks and tree cables are useful for hanging bird feeders, hanging bird houses and hanging plant baskets. The Bird Feeder hooks or garden hooks can be hung from a tree branch, porch or patio. Strong suction cup hooks can be used to hang bird feeders from windows. Pair of Bird Feeder Branch Hooks are two 24 inch long hand made of heavy gauge steel. Great for hanging bird feeders, bird feeder baffles and bird houses in trees. Pair of 36 inch limb protector Bird Feeder Hanging Cables with hooks for hanging bird feeders, bird houses or hanging plants. 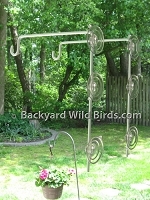 Having a window feeder is easy with a pair of metal Window Bird Feeder Hooks for hanging your window bird feeders on.